A DEFIANT Alex Salmond made his final appearance at First Minister’s Questions yesterday – and insisted his Government had made “substantial achievements” in office. And in another swipe at opponents he will today invoke England’s World Cup win as he promises to fight on for Scottish independence . Salmond will adapt the famous line of commentary – “they think it’s all over, it is now” – at the party conference in Perth. Salmond, who will step down as SNP leader just hours before making the speech, made his final appearance at First Minister’s Questions yesterday . He said: “I think the administration has had a substantial record of achievement over these last seven years. But Labour claimed his “real legacy” is leaving Scotland “more divided than ever”. Stand-in Scottish Labour leader Jackie Baillie told him: “Today does mark the end of an era. No one can deny Alex Salmond’s passion for Scotland, nobody can deny his love for his country. Salmond will hope his speech today can enthuse his energised party ranks just two months on from his 55-45 defeat in the independence referendum . He insists the vote signalled the beginning of the end for the Union. He will say: “Despite everything the Westminster establishment threw at Scotland, 45 per cent of the people – 1.6million women and men living and working in Scotland – chose hope over fear. “A much higher number than our opponents thought possible when we started this campaign. Salmond announced he was to quit on the day of the referendum defeat . But he leaves the party in remarkable shape for incoming leader Nicola Sturgeon. Since the referendum, membership has surged from about 26,000 to 84,000. 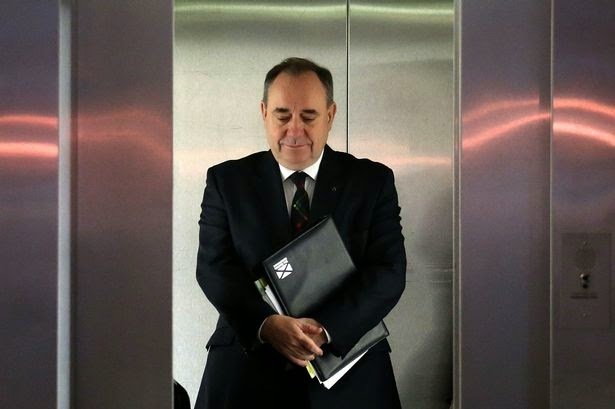 Salmond wants another push – to 100,000.